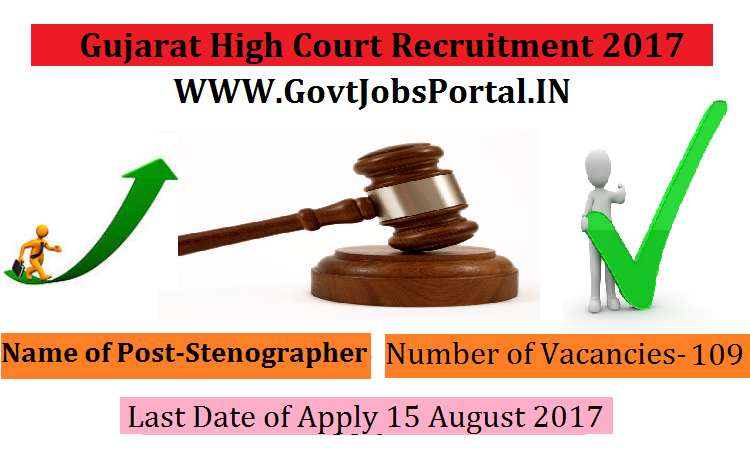 Gujarat High Court is going to recruit fresher candidates in India for Stenographer Posts. So, those candidates who are willing to work with this organization they May apply for this post. Last Date of Apply 15-August-2017. Total numbers of vacancies are 109 Posts. Only those candidates are eligible who have passed Graduate in any discipline from a recognized university or any equivalent qualification recognized by the Government. Speed in English Short Hand 120 w.p.m or Gujarati Short Hand 90 w.p.m. Indian citizen having age in between 21 to 40 years can apply for this Gujarat High Court Recruitment 2017. Educational Criteria: Only those candidates are eligible who have passed Graduate in any discipline from a recognized university or any equivalent qualification recognized by the Government. Speed in English Short Hand 120 w.p.m or Gujarati Short Hand 90 w.p.m.